Not quite full black out. Still allows some light to shine through. Nice pattern and color but definitely would have wanted them to be full blackouts. 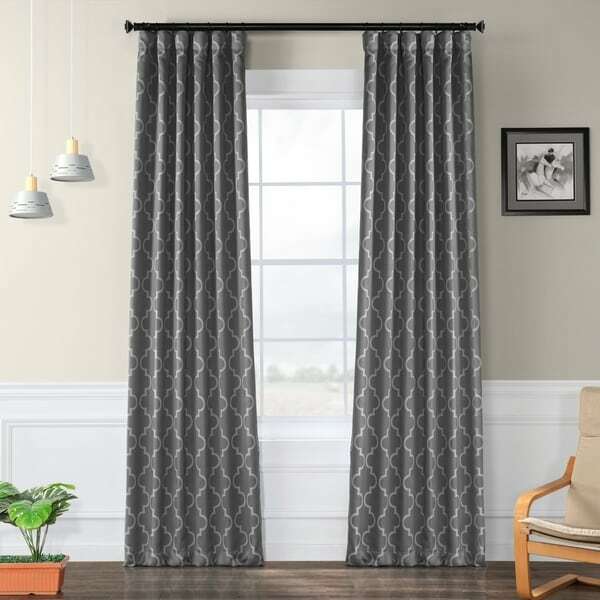 Bring elegant style, privacy, and comfort into your home with this Seville Print Blackout Curtain Panel Pair. Its thick design helps lower monthly heating and cooling bills and Seville print and variety of color options make it the stylish and practical choice. For proper fullness, panels should measure 2-3 times the width of your window. I purchased these curtains for our bedroom, which has extremely large windows. They do an excellent job of blocking out the light, and they look beautiful, expensive, and elegant. The picture is very accurate. I threw them in the dryer for about 30 min to take out the wrinkles from folding in the packaging. The measurements are accurate as well, but we ended up getting 3 panels to cover the whole window completely. Purchased 4 panels 98 inch long and two panels 120 inches long. Love it all. Price was very good, so is quality and service. Thank you. I am moving into a new home and am going to create a "curtain wall" with these curtains. I have 3 windows on the wall and am covering up one of them with these curtains. The only problem is I will need to put in additional cover over the window before I hang these because it does not shut out the light entirely. The design is very elegant and the color is amazing (a blueish gray or a grayish blue ) . They hang very well and look very classy. The price of these would've been reasonable if it was a pair, as advertised. But it is a single panel, and for rather shiny 100% polyester, it isn't a great deal. Also, it has a top "tube" style rod pocket rather than nicer grommets and this makes it seem a little cheaper as well. These will be getting returned. Perfect for The Whole House! Bought 4 panels 108 inch long for 9 foot ceilings and a huge triple window, these look perfect hung high and wide! 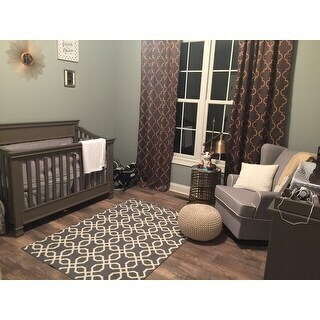 I also bought the gray and gold color panels for my sons room and they matched perfect. These curtains are thick and nice quality and they are excellent if you want to close and have a dark room. These hang beautifully. They are a true medium gray with no blue or purple tones. I am glad I purchased 2 sets (4 panels total) for my living room window which is 9 feet wide. They bunch nicely when pushed open and cover the window completely when closed. The fabric is medium/heavy weight and has a luxury silky feeling. The blackout material on the back is white in color so it looks nice from the outside of the house. These truly block out the light and help keep the room warmer in winter and cooler in the summer. Still can't believe the quality at this price point. In the past I've purchased my drapes from Pottery Barn or Restoration Hardware. Which I love to shop at but when I saw the price of these I just had to try it. Nothing to lose especially since overstock.com has great customer service and it's very easy to return or exchange items. First of all my drapes tracking said it was delivered but it was not. So I contacted Overstock, and they immediately processed a replacement to be sent to me free of charge. The next day my drapes did show up so I did contact Overstock to get that replacement order canceled. They were very courteous and helpful through the whole process . The blackout works well for these drapes. I'm very impressed with the quality of the fabric and the look of it. Matches my decor perfectly and I get so many compliments. I love it more than I thought I would love it. And for the price, especially if you have a coupon... It's a no-brainer! The color is more beautiful than I could have thought from looking at the photos on line. Love my purchase! I bought 2 sets of these curtains in grey 108" for my living room. I was impressed with the quality. They looked stunning. More importantly, I loved the fact they were thick enough that you could not see the sun shine through the section where they overlapped the window area. Because they were so elegant I decided to purchase a set for my family room. After I got them up I decided everything looked so great I would also put them in the kitchen table area. By that time there was only one panel left at Overstock. I ended up having to order one panel at a competitor which cost me $$ extra for the same panels I had ordered from Overstock previously. That is why I love Overstock!!! I seldom shop anywhere else. Great products, great service, great prices. Love these curtains! I was worried the teal would be too bright based on the picture but they are the perfect color. Thick and tough material too. The print color in the photo shows a dark brown to black against a tan background so the prints stand out. The actual product the prints are light brown so it doesn't look as nice. But the material is very soft. Will return because it doesn't look as nice as the photo. Changed color in less than a year! All the areas exposed to sunlight have changed to pink (yes, pink) in less than 9 months. We live in South San Francisco where there is not even a lot of sun! Originally they looked beautiful but now it's partially gray/blue and partially pink. I purchased these for the New Year..they are beautiful. Not too heavy or light, they do block out some sunlight but I would not call them total block out curtains. I paired them with coral sheer curtains. Again..simply gorgeous. These were very pretty but i sent them back because i found a pattern that worked better. These drapes hang well and are striking. Good to darken a room. Nice material and pattern. These are beautiful and great quality! Very happy with the purchase. They have the weights at the bottom to keep them straight and the fabric is good quality (right amount of shine). Great curtains. They are just as described, and the color is perfect in my house. I get lots of compliments, as they look like really expensive curtains. Love the quality. Adds to the room for sure. These are beautiful. Get lots of compliments. Great quality, hangs nicely and covers light solidly. I just love love love these panels. They look great and added just the right touch of class. I would recommend this product and I'm thinking about ordering them again. "I am interested in the curtains #8, the color is cream/ ivory with gray design or brown? And the gray background the design is silver?" The item shown in image 8 is a beige with tan. "How many curtains are included in each package?" "I too would like to know what the name of the color profile is for the cream background and gray trellis design? Is it called Tan? I have been wanting to order these for a while, but don't want to order the wrong color..."
"I am interested in the lightest option- this is the cream/white background with a trellis design in grey/tan. Not sure if I need to order the TAN option or another color. Anyone know what color name to order?" "What is the width of these panels?" These panels measure approximately 50 inches wide. "Are these also a THERMAL curtain?" "What color is the back side of the curtain? Same as the front, or is it white?" The back is white. I have the navy blue and they're just beautiful! Very classic and elegant!